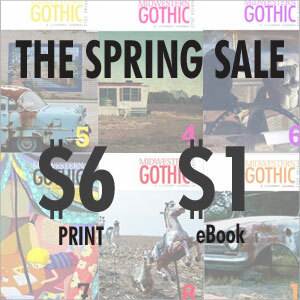 Midwestern Gothic – A Literary Journal » Blog Archive » The spring sale is here! Sure, spring is still a week away, but the name matters not: For a limited time, all issues, old and new, are only $6 (print) and $1 (ebook, various formats)! If you missed the deals we had at AWP, now’s your chance to pick up your favorite issue for a fraction of the cover price.